Just when I was done with lamenting about Indonesia's transport safety about a week ago, another one bites the dust. How many more lives do we need to sacrifice before the Indonesian gahmen finally wake up their bladdy ideas? My earlier entry thrashing the Indonesian gahmen, with regards to safety, was met with a lively debate, in the comments section, arguing in their defence. I guess I no longer need to carry on the debate anymore as the facts are stacked in my favour with yet another Garuda meeting its maker. 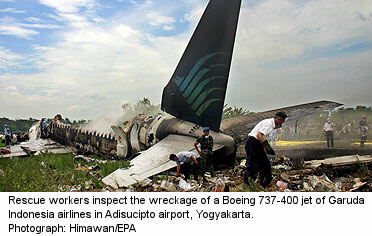 As you are aware, Garuda is Indonesia's national airline. It represents Indonesia in the world of aviation and often regarded as a benchmark for many things, including safety standards, in its home aviation industry. If the safety benchmark of Garuda, the national flagship carrier, were to be dismal, I really hate to think how much worse the rest of the domestic and private airlines would fare. Again, being the national flagship carrier, there is nothing above that already. So in a morbid way, I would have to say that being doomed is the best one can expect when taking an Indonesian airline, at the rate things are going. Some may blame it on the age of the planes. It is a fact that 80% to 90% of Indonesia's planes are between 10 to 20 years old. This is in contrast with SQ's fleet never beyond 5 years old. The way I see it, planes can go up to 30 years in active service as long as there are regular and good maintainance. So the fact that planes are more than 10 years old is not really an issue here. Indonesia airlines have reportedly bribed pilots to fly the plane even if the plane has been declared non-air worthy and fly them for months at a time. Those who attempted to blow the whistle on management, often find themselves grounded or docked pay for some reason or another. Anyway, the question beckons if the Indonesian gahmen would start to take positive action from hereon? Would this crash be finally the one to wake everyone up? Forgive me if I continue to be skeptical as I for one, would rather see results than simply relying on empty promises. At best, I would see investigative committees being set up and all sorts of new policies being introduced and implemented. But guess what? After a few months, when the memories of all these disasters have faded into a distant memory, the safety breaches will all return and everything would revert back to the "good old days" of "carefree flying". Good luck, Indonesia. Good Luck. "Ladies and Gentlemen, welcome aboard. In the event of a crash, we will try our best to do it on land. That way you do not have to worry about the absence of life vests, no long under your seats. Also, fastening of seat belts are now optional. You are screwed either way. Thank you for dying with Garuda." I am shocked with this news as well... well in my opinion, Indonesia will never wake up their idea for this........... let us pray for our neighbour!!!! Sunflower: As gloom and doom the whole situation may look, there is always hope. While I am deeply saddened and disappointed, there is still that sliver of hope that the situation gets a turnaround. James: Welcome to the blog. SQ's young fleet is more of a financial strategy than anything else as it involves resale to other airlines. This is something that only the financially strong are able to undertake. Kudos to the management of SQ to be able to do what other airlines can only dream of. It is true that one of SIA's strong selling points is a young fleet. On their website, it says their fleet averages 6 years old. Do note the words "averages 6 years" meaning that some of their planes can be older than 10 years. But on average, since the airline always adds new planes, the fleet is 6 years old. Having said that, a plane that is well maintained can be used for a long time. ihawk98: I believe I read it off a luggage sticker (back in the old days, it is quite trendy to paste stickers especially destination related ones) where it says that SQ planes are never older than 5 years old or something to that effect. That was way back in the early 80s. I guess they revised that to averaging 6 years? Anyway, that's not the point here. My point is that with good, regular and stringent maintenance, a plane can last a very long time.